The Barbados Defence Force is conducting an All Arms Advanced Drill and Ceremonial Course 1/2018 during the period Monday 3 September to Friday 5 October 2018 at HMBS PELICAN, Spring Garden. The aim of the Course is to teach students how to deliver technical knowledge of Drill to their respective organisations. 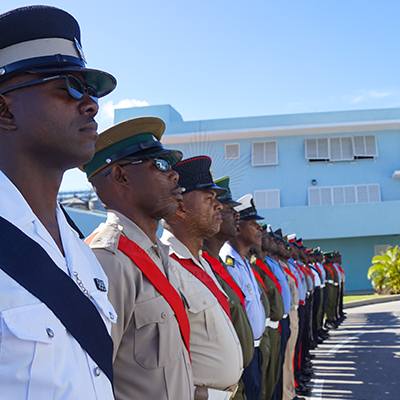 Students on the Course are drawn from the Barbados Regiment (6), the Barbados Coast Guard (4), the Royal Barbados Police Force (5), Her Majesty’s Prisons Service (5), the Jamaica Defence Force (2) and from the Regional Security System Member States (Antigua and Barbuda Defence Force (2), Royal Grenada Police Force (2), Commonwealth of Dominica Police Force (2) and the Royal St Lucia Police Force (2)). Course Coordinator Master Chief Petty Officer Class 1 David Knight noted that the Course will be physically demanding, provides students with improved standards of Drill, enhances prospects for promotion and develops each student’s ability to plan and execute a ceremonial parade. All Arms Drill and Ceremonial Course participants.